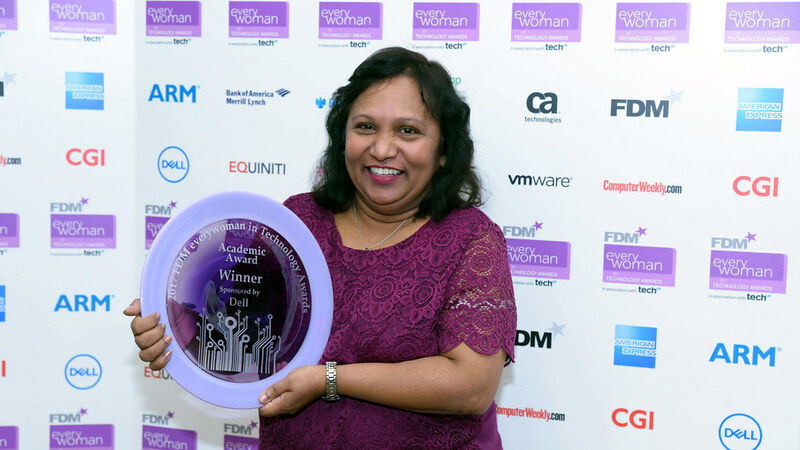 Winner of the 2017 FDM everywoman in Technology Awards Professor Semali Perera. In its seventh year, the FDM everywoman in Technology Awards celebrate the contributions of women who are changing the face of technology in the UK, and their role in inspiring and supporting the next generation. From entrepreneurs and engineers driving the business agenda to students and academics raising the profile of science and technology subjects, the 33 finalists were handpicked from hundreds of entries by a panel of some of the UK’s most senior technology leaders. Announced at a prestigious awards ceremony at the London Hilton, Professor Perera was named the winner of the Academic Award. Sponsored by Dell, this award recognises a woman in academia who has made an outstanding contribution to technology and science and whose work has made or has the potential to make a significant long-term impact in STEM (Science, Technology, Engineering and Mathematics). Professor Perera is a Chartered Engineer and a Fellow of the Institution of Chemical Engineers (IChemE) whose 23-year career has been distinguished. In 2002 she was presented the Mary Tasker Award for Excellence in Chemical Engineering Teaching, and in 2007 the prestigious Royal Society Brian Mercer Award for Innovation (2007). In addition, her work on pollution control technology led to the formation of a University of Bath spin-out company nano-porous solutions ltd which was acquired in 2013 by IMI plc, a FTSE-100 listed company. A leading chemical engineer, Professor Perera’s research specialises in developing novel sustained drug delivery methods for cancer sufferers. She is currently leading a team at the University of Bath to develop an innovative way of delivering sustained chemotherapy treatment to cancer patients which has less negative side effects and cuts the number of patients dying as a result of the high doses of treatment needed to kill the cancer. Professor Perera said: “I am honoured to have been recognised by the FDM Everywoman of the Year Awards. I hope this accolade will enable me to continue inspiring young people, and in particular young women, to study STEM and engineering subjects in which there remains a gender imbalance. Professor Tim Mays, Head of the Department of Chemical Engineering at the University of Bath added: “Professor Semali Perera is an inspirational academic engineer who has a keen eye for the impact of her research in a critical area of modern healthcare. Semali's achievements well-deserve the recognition that this important Award represents. This is the second consecutive year a University of Bath member of staff has been recognised at these awards with Head of Physics Professor Carole Mundell named overall winner at last year’s awards. The Department of Chemical Engineering at the University of Bath is one of the best in the country. Ranked number one for course satisfaction (Guardian University Guide 2017) and third in the UK for chemical engineering and graduate prospects (2017 Complete University Guide), 89 per cent of the Department’s research is graded as either world-leading or internationally excellent (Research Excellence Framework 2014).